Kir Jensen is a sugar pusher. From the window of her bubble-gum-pink-and-chocolate-brown food cart, she encourages consumption of all things sweet, from her chocolaty Triple Threat cookies to daily specials that highlight Oregon's bounty. 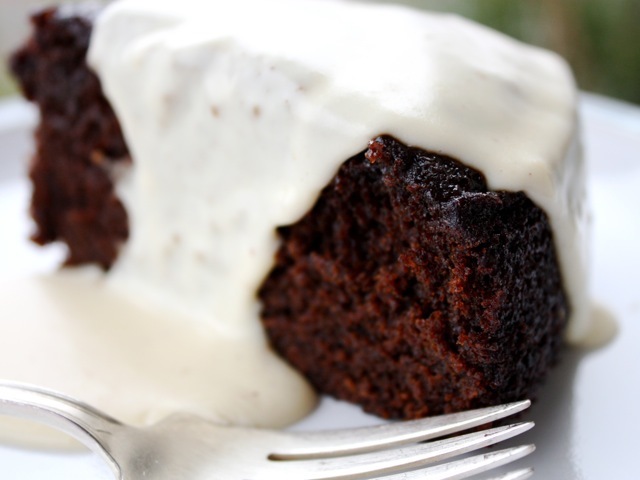 Here, she's adapted a recipe from the lauded pastry chef Claudia Fleming to use Oregon stout and create a complex, deeply spiced molasses-ginger cake. This recipe makes one 9-inch cake. You can make it at least one day ahead of serving, as it gets better with age. Note that the batter needs to chill for a few hours before baking. Make the cake: Bring the stout and molasses to a boil in a large saucepan. Remove the saucepan from the heat and whisk in the baking soda. The beer will bubble and foam a bit. Let cool. Whisk the brown sugar, granulated sugar, and eggs together in a medium bowl until well combined. Whisk in the vegetable oil, fresh ginger, and vanilla. Whisk in the cool beer mixture. Whisk the flour, ground ginger, baking powder, cinnamon, cardamom, cloves, nutmeg, and a pinch of salt together in a large bowl. Add the beer-sugar mixture to the bowl and whisk until smooth and well combined. (The batter will be thin.) Cover the bowl with plastic wrap and refrigerate for a few hours or overnight to thicken. Position a rack in the center of the oven and preheat the oven to 350 degrees. Coat a 9-inch round baking pan with cooking spray. Pour the batter into the pan and bake until a tester stick inserted into the center of the cake comes out clean, about 55 minutes. Make the glaze: Heat the granulated sugar, water, and ginger in a small saucepan over medium heat, stirring occasionally, until slightly syrupy, about 20 minutes. Strain the syrup into a small bowl. Discard the ginger. Let cool slightly before brushing the warm cake liberally with the syrup. Let the syrup cool on the cake for 10 minutes before serving. Culinate editor's notes: You can serve this cake as is, or with freshly whipped cream or ice cream. For a spicy ice cream, try Cardamom Ice Cream; for a beery pairing, make Hank Sawtelle's Stout Ice Cream. Because this cake is reminiscent in flavor and texture of Christmas pudding, you might want to serve it with a warm hard sauce. Consider, also, a gently heated homemade caramel sauce.